When there are no moderators in the chat, users can flag unwanted messages. If a person's messages get flagged by enough users, the sender of that message will become restricted from posting in the group for a certain period of time. Chatango provides multiple moderation mechanisms that allow group chat owners (i.e. users that created the group chats) and moderators that they make to ban unwanted users and delete their messages. Chat Moderators are not made by Chatango, they are made by the owner (creator) of each individual chat group (typically, the owner of the web site in which the group chat is embedded). If you wish to report abuse in a group chat please report it to the owner or a moderator in a group first. 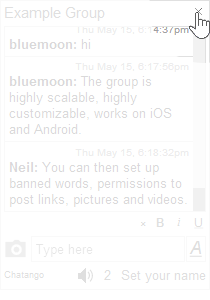 Group owners can ban certain words from a chat. To set the banned words you must be logged in as the group owner. Click here for more information. If you visit a web page with an embedded Chatango chat, but do not wish to see the chat on it, you can turn it off by clicking on the at the top of the chat. This setting will be remembered for the subsequent visits to the site. If you do not see control, you need to log out from the chat first, by clicking on the Main menu > Log out. If you find a profile page that has offensive content, you can report the picture on the page by clicking the report picture link below the picture. If other parts of the profile are inappropriate you can report the profile by opening a new chat with the person (if you do not type anything they will not know that you have done this). In their mini profile at the bottom left of the private chat page you will see the report button ( ). You can use this to report their profile. Please note that Chatango does not monitor or censor group chats or instant messages. We encourage users to moderate content that they consider inappropriate as described here and here. Individual messages sent to Chatango chats are owned by the users who wrote them. We strongly believe in the principles of free speech. Although Chatango may investigate other incidents, the language of Section 230(c) of the Communications Decency Act fundamentally states that Internet services like Chatango.com are republishers and not the publisher of content. Therefore, Chatango is not held liable for any allegedly defamatory, offensive, libelous or harassing content published on the site. Please note that Chatango is a provider of chat tools, not a mediator of posted content.